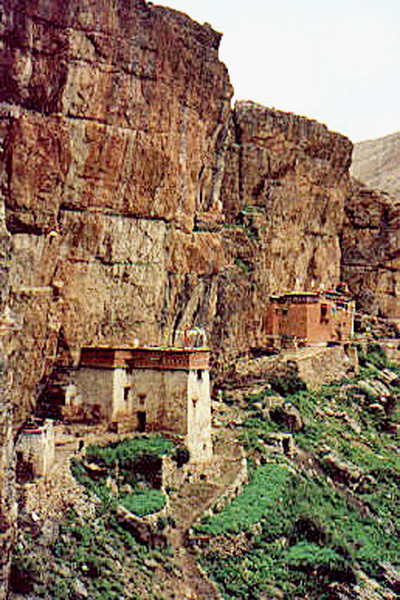 Tsakhang Gompa is among a cluster of monasteries of Shey Gompa, the seat of the Dolpo Shel-ri Rinpoches in Upper Dolpo, Nepal, more than 16,000 feet above sea level. Located within a cradle in the craggy rock mountains, it sits on a narrow precipice against a backdrop of red cliffs. Nearby is the well-known sacred Crystal Mountain, Shelri Drug Dra. In 1982, the Fourth Shelri Choktrul Rinpoche offered Tsakhang Gompa to the Third Jamgon Kongtrul Rinpoche and requested him to also take care of Shey, Sumdo and Gomoche Gompas. Upon the parinirvana of the Fourth Shelri Choktrul Rinpoche in 1991, the Third Jamgon Rinpoche assumed the responsibility entrusted to him. He also decided that the future Fifth Shelri Choktrul Rinpoche would train and study at Pullahari Monastery. Upon receiving the prophecy of his rebirth, Jamgon Kongtrul Labrang embarked to search for the reincarnate. The Fifth Shelri Choktrul Rinpoche was found in 1998. He was born in Bije, Upper Dolpo, in the Rooster year, 1993. Today, the Fifth Shelri Choktrul Rinpoche studies with His Eminence the Fourth Jamgon Kongtrul Rinpoche.